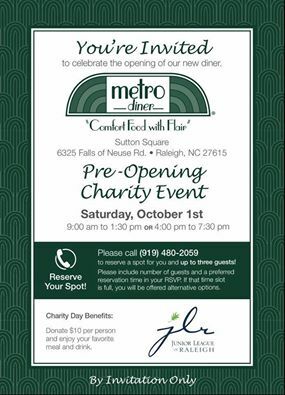 You’re Invited to celebrate the opening of our new diner with a Pre-Opening Charity Day event benefiting the Junior League of Raleigh. Donate $10 per person and enjoy your favorite meal and drink. Please call (919) 480-2059 to reserve a spot.